This is an awesome car that is very fun to drive. I feel very safe while driving it, but I have a hard time backing up. This little car can definitely hold it's own when it goes against stronger cars. Highly recommended. Sorry, we couldn't find any Mitsubishi Eclipse listings that matched your search criteria. Here are Nationwide listings for a Mitsubishi Eclipse. 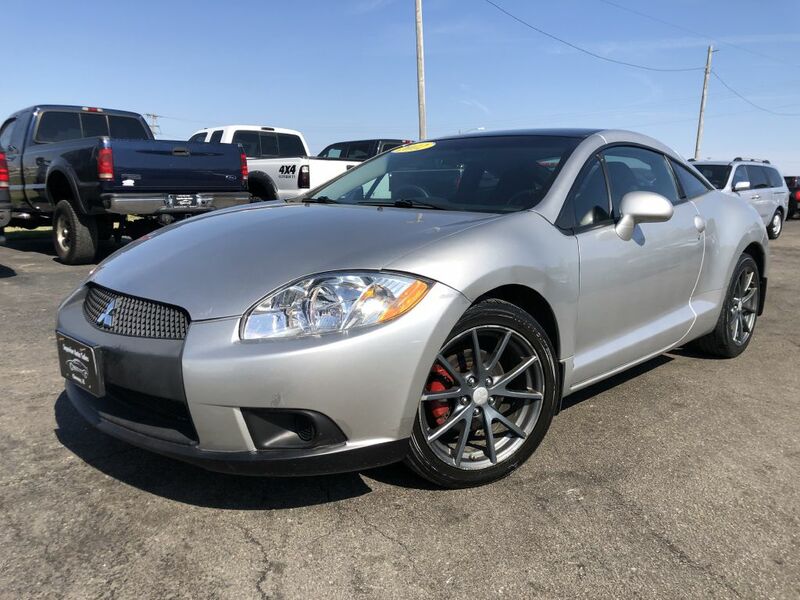 Here are our listings for all model years of the Mitsubishi Eclipse. Sorry, we couldn't find any 2012 Mitsubishi Eclipse listings that matched your search criteria. You might be interested in these similar years for Mitsubishi Eclipse. Avg. Dealer Rating: (10 reviews) "Very upfront and easy to talk to. they went to great length to make me happy. Super satisfied , great experience and highly recommended "
Avg. Dealer Rating: (24 reviews) "We went to this dealer and took a truck for a test drive. We didn't like to one we drove, so we asked about another one and they suggested we wouldn't like that one and asked us to come back the next day to drive it. We came from an hour away and it is difficult to get there by the time they close. So we will be going somewhere else to find our truck. " Avg. Dealer Rating: (7 reviews) "Quaint little car dealership with a variety of nice cars. We looked at a Ford Focus which we ended up not purchasing, but the gentleman that we dealt with was nice, knowledgeable, and didn’t pressure us!" Avg. Dealer Rating: (1 review) "Had an awesome experience Ben, Gena and Andrii did an awesome job highly recommended dealership drove from South Carolina to pick up are 2017 Tacoma worth the trip "
Avg. Dealer Rating: (110 reviews) "They responded by thanking me for inquiring about one of their vehicles, said they had many more vehicles to choose from and encouraged me to come to their establishment to look at their inventory. I would have liked to be able to ask a few questions about the vehicle however, I understand that they would like you to come to their place of business because foot traffic is easier to sell you a car than through the computer...LOL I did like that it did say that I could come and negotiate prices with their people, that's always a good thing to be able to do to possibly get a better price." Avg. Dealer Rating: (3 reviews) "They were quick to get back to me. Was an easy process. I didn’t feel like they pushed me to buy a car. Asked when I was ready to buy. I was ready to buy, so I did." Avg. Dealer Rating: (28 reviews) "The dealer good night keep to their words out there they told me I needed to bring 500 down and for a 2009 Volkswagen Jetta with almost a hundred sixty thousand miles on it and they would do what it took to get me in it and then when I got there I got dropped off supposed to get the car and they raised it down payment price and tried to put me in something else"
Avg. Dealer Rating: (142 reviews) "They did a good job by getting back with me right away"
Avg. Dealer Rating: (65 reviews) "It was okay. Vehicle was listed for $27,000 on the internet page. Went there to talked to a sales rep and was told the price was $29,000. I never went back"
Avg. Dealer Rating: (1 review) "Nice"
Avg. Dealer Rating: (6 reviews) "Excellent customer service "
Avg. Dealer Rating: (31 reviews) "They were super friendly and we did get a great deal on our car. Only fall back for us was that we drove two hours to see the car but was unaware of a bumper imperfection that was definitely noticeable from a previous accident and it had not been fixed. It wasn't noted in the description or the pictures so we were kind of shocked/disappointed at first. But we do love our new car either way!"